The ICC Code of advertising and Marketing Communication Practice (ICC: International Chamber of Commerce) contains general provisions recognized by all professionals. One of them lays down, as a basic principle, that « All marketing communications should be legal, decent, honest and truthful » (Article 1 – Basic Principles). According these professional and ethical rules and to the positive law, advertising of a product, whatever form it may take, must be clear, loyal and truthful. The ICC Code also states that: « Commercial communication should not contain any statements, claim or audio or visual treatment which directly or indirectly, or by implication, by omission, ambiguity, or exaggerations is likely to mislead the consumer, in particular, but not exclusively, with regard to […] the value of the product and the total price to be paid by the consumer « (Article 5 on Truthfulness). In order to encourage compliance with these principles, professionals  have established rules for the presentation of prices and related remarks. This Recommendation applies to advertisements whose main purpose is to communicate on one or several prices figures and that are disseminated to consumers outside the point of sale and / or outside the electronic merchant sites. The rules of this Recommendation cover both price and the related indications. By « remarks » we refer the so-called legal notices (e.g. specific terms and conditions required by law), the “rectification notices” (e.g. those which limit the meaning or scope of the price mentioned in the advertisement, as well as information notices. It is reminded that remarks that are not linked to a price figure are subject to the rules set out in the Recommendation « Notices and References« . These general and specific rules are designed for an average consumer that is to say, reasonably informed, attentive and sensible. These rules apply unless applicable law imposes specific requirements for the presentation of the price and related indications. The price must be legible in normal reading conditions. In a color that contrasts with the background color of the advertising, for instance, avoiding a light color against a light background. When a sign accompanies the price and is used to make a reference to a related remark, the size of this sign next to the price must be large enough to be always legible under normal reading conditions. The intelligibility of the price implies to use of a wording allowing the consumer to understand it without difficulty and in a non-erroneous way. Thus, the presentation of the price (s) must allow the consumer: to link the price (s) presented with the product or service he / she will benefit for this amount of money, and to know whether there are conditions or restrictions. Whatever the advertising medium, the legal, rectification and information notices or information related to the price must be legible under normal conditions of reading. In a color that contrasts with the colour of the background of the advertising, for instance, avoiding a light color against a light background. When a sign  is used to make a reference to a related remark, the size of this sign, at the beginning of the remark must be large enough to be always legible under normal reading conditions. For remarks that appears in a static overlay on the screen or within a scrolling text (whether the banner is materialized or not), the duration of exposure or the speed of the scrolling must allow the consumer to read the entirety of the information without waiting for a new broadcast of the advertisement. When the background of the message is not the same color throughout the advertisement, depending on the script and the set, it is essential to check the perfect readability, in terms of contrast, for all remarks. If necessary, a banner will be materialized, with a single color which will contrast with the color of the characters chosen for the text appearing in the said banner. The character size of the remark must be chosen according to the format of the medium and the format of the advertisement. If a publication or an advertisement has a reduced format, the size of the chosen characters is decisive; it must always allow the reading of remarks and references to the price under normal conditions. The font size of the remarks must be chosen according to the format of the billboard and its type of location. Special attention shall be given to the display time and the font size according to the diversity of formats, techniques and existing advertising media. In advertisements featuring remarks in a scrolling text, special attention shall also be paid to the scrolling speed and to its good contrast with the background color. Where the format, technique or advertising medium does not allow the remarks to appear on the advertisement itself, they shall be made directly available by any other means. Where price-related remarks are mentioned in a radio advertisement, they must be easily audible. When referring to another page (in the case of catalogs, mailing, etc. ), the details of the references to the remarks , especially their location in the document, must be perfectly legible and clear. The intelligibility of the remarks implies a wording allowing to understand their meaning without difficulty and in a non-erroneous manner. a clear and simple sentence structure. Excessive overlaying of information which could affect the clarity and intelligibility of advertisements should be avoided. The different remarks set out in an advertisement must not contradict one another. In advertisements with several prices, accompanied by a reference, the use of a unique and apparent sign is required for each price. In this case, to be coherent, the representation of the different signs should preferably be done with numbers or letters and be sufficiently clear so as to enable the reader to understand which remark corresponds to each of the signs present in the advertisement. b/ be clearly connected to the gimmick by means of a sign. When they come in addition to other references, the consumer must be able to distinguish them easily (use of bold type, underlining, different color or size, etc.). When several prizes appear in the same advertisement, it is always possible to highlight one of these prices. In order to do so, the different prices may be presented with different font sizes, provided that they comply with the aforementioned principles of legibility, intelligibility, clarity and transparency. The presentation of several prizes in an advertisement should not lead to any ambiguity for the consumer as to the relationship between the prices and the products or services to which they correspond. The “TTC” price must be included in advertisements targeted to consumers. When the price excluding tax is also indicated, the “TTC” price shall not be less readable than the “HT” price (in terms of font size, contrast, duration of exposure on the screen or positioning in the advertising). In the case of products sold as a bundle, the advertisement must clearly and conspicuously show the total price of the set. Some advertisements disseminated outside the point of sale and / or outside the electronic merchant sites may present price discounts reserved for groups of consumers (loyalty card holders, depending on age or the number of persons in a household, or in the scope of partnerships with other merchants or service providers, etc.). When an advertisement targets both consumers benefiting from these discounts and consumers who do not benefit from them, the presentation of the different respective applicable prices must not be such that the non-promotional price appears in a less readable manner(font size, location, etc.). 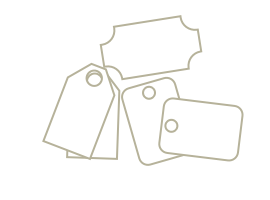 When an advertisement presents a price offer linked to a loyalty card in the form of purchase or credit vouchers registered on the card, the presentation of a price, deduction made of the amount of the discount to be applied on future purchases, must not be such that the price to be paid appears under conditions of lesser readability (character size, location, etc.). In the case of an advertisement indicating a price » starting from », the price of the product or products represented must be perfectly legible and easily identifiable by the use by any appropriate means (character size, character color, location, use of bold type, underlining etc.). The sign may be, for example, an asterisk (a star), a number, a letter, etc. These abbreviations “TTC” and “HT” are used in France to respectively designate, "All Taxes Included" and "Excluding Tax". The applicable tax is value added tax (VAT). Whatever it may be, whether required or not by a text of positive law.